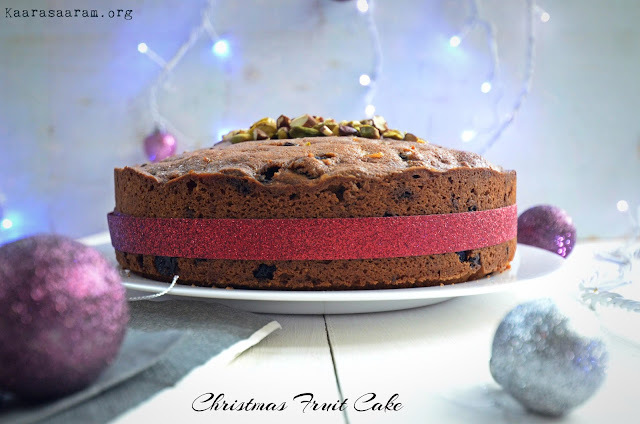 It is that time of the year when the air is filled with the sweet scent of cinnamon, nutmeg, orange , mulled wine, log fires and much more ..
Not to mention about the classic festive bakes with doubles up as treats for family members and edible gifts for friends and colleagues..
Fruit & Nut cake is one such classic which makes us feel Christmassy in every bite. 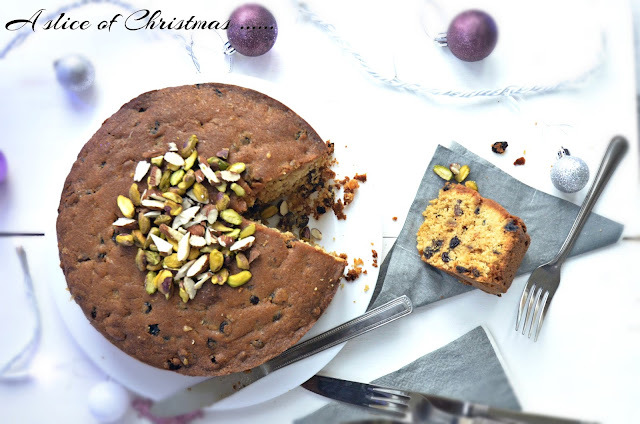 It is a perfect marriage of dried fruit & nuts and heavenly aroma of spices which is tied together with the fresh flavours of oranges and honey. 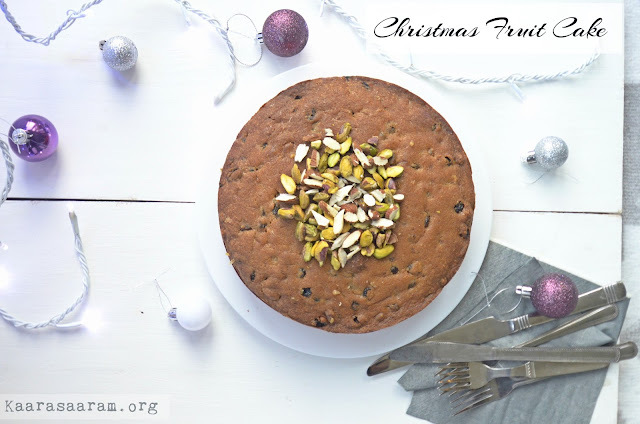 J.M.Bakes in Coimbatore was & is famous for its plum cake. The cake was sold as slices wrapped in plastic wraps with no glazed or extra toppings. We were so crazy about this cake that it was our weekend treat during school time. At that I didn't know about spices or dried fruit or glazed cherries or muscavado sugar but all I knew was that the cake tasted awesome. For this recipe I did not add cherries as I wanted a cake that was light but at the same time rich with flavour. This is my preference but feel free to add glazed cherries if you prefer to. I have made a few changes to the original recipe and it turned out well. Preheat the oven at 180C/Gas mark 4/Fan 160C. Grease and line the base and sides of 23 inch loose base round cake tin. Mix the flour, ground almonds and ground spices. Beat the butter and sugar until light and creamy. Add the eggs one by one and mix thoroughly. Add the dry ingredients and the dried mixed fruit. Mix lightly as to blend everything together. Pour in the prepared cake tin and bake for 45mins to 1 hr. In the meantime mix the orange juice and honey together. Once the cake id done, remove from the oven and let the cake cool slightly. Remove the cake from the tin. Brush the cake with the orange honey mix until well absorbed. Decorate with the dried nuts. Instead of the mixed dried fruit, feel free to add 1 or 2 varieties of dried fruit - raisins, dates, cherries, stem ginger with any nuts of your choice. Instead of the orange honey glaze you can also decorate with marzipan and fresh fruits like grapes and figs. The cake keep good for almost a week without the orange honey glaze. Merry Christmas every one .. Enjoy the holiday season..